Researchers at the University of Hawaii at Manoa have developed innovative techniques that could have profound effects on congenital cervical vertebrae malformation research. In the cover-featured research article of the November issue of Molecular Reproduction and Development, researchers looked into congenital cervical vertebrae malformation in humans that can cause neural problems and increase susceptibility to stillbirth in women. Research advancement on abnormal vertebrae development has been limited due to the lack of lab animals with taxonomic equivalency to humans (animal models), and restrictions on human subject research. Leading the research effort was Dr. Jinzeng Yang, a molecular biologist in the College of Tropical Agriculture and Human Resources’ Department of Human Nutrition, Food and Animal Sciences. Researchers from Yang’s laboratory have developed a new mouse model that reveals how patterning and developmental proteins can influence cervical vertebrae formation. The mouse model uses a gene suppression technique that induces skeletal formation. The mice and their offspring appear normal but have striking cervical vertebrae formation. Yang’s new gene suppression technique offers benefits, in this case, over the mouse model generated by complete gene removal (knockout mice), which cause mice to die shortly after birth. Yang’s laboratory has been studying myostatin, a protein playing a dominant role in reducing muscle mass. By genetically blocking the function of myostatin by its partial DNA sequences, mice were developed with 40 percent more muscle mass. 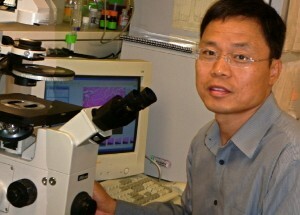 Yang’s graduate student Zicong Li, the first author of the publication, hypothesized that this gene suppression strategy would also work to stimulate skeletal development by inhibiting growth differentiation factor 11 (GDF11), a similar protein to myostatin, and produce live animals. Previously, the mice with complete removal of the GDF11 gene or knockout mice died shortly after birth. In collaboration with Dr. Stefan Moisyadi’s laboratory in the UH Institute of Biogenesis Research, they generated the transgenic mice by using a new single plasmid system of piggyBac transgene delivery, which offers greater transposition rates and precision. The original research article is titled, “Transgenic Over-Expression of Growth Differentiation Factor 11 Propeptide in Skeleton Results in Transformation of the Seventh Cervical Vertebra into a Thoracic Vertebra.” The publication is available online. Work was supported by grants from the U.S. Department of Agriculture and the National Institutes of Health.